Get married on island time in Washington's Puget Sound. Forget the tropics. 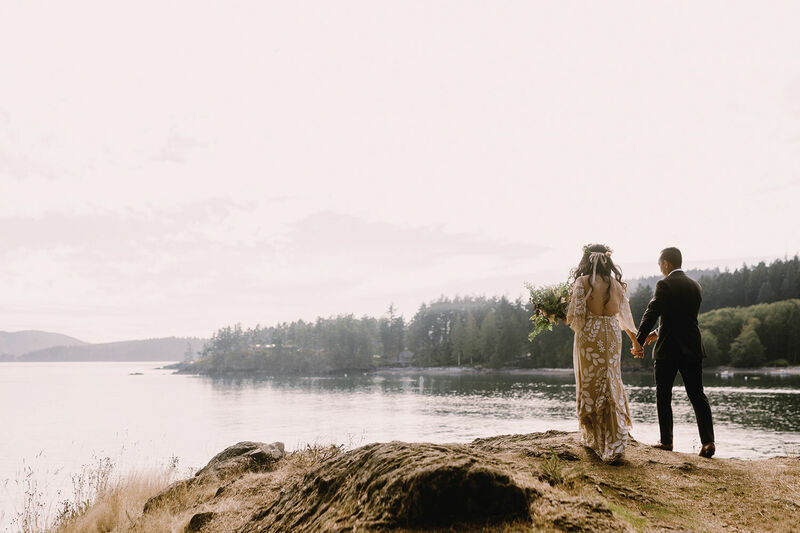 When it comes to island weddings, the Pacific Northwest has its own watery retreat—the San Juans. 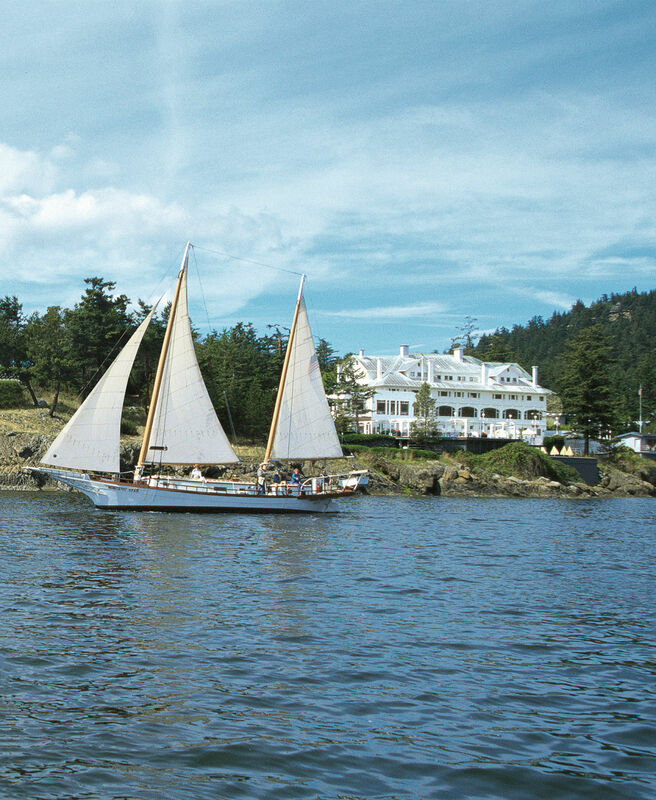 The largest island of the archipelago, Orcas Island, lies about 100 miles north of Seattle and is a beloved wedding destination for good reason—remote beaches, quaint bed-and-breakfasts and resort accommodations, endless outdoor adventures, fresh-caught seafood and farm-to-table dining, and all the services needed for your special day. Orcas’s appeal is in part tied to its deep agricultural roots. Up until the 1900s, the 57-square-mile island was one of the largest producers of fruit in the state, and today it’s still brimming with apple and plum orchards, beautiful nature escapes, native wildlife, and thriving community. It’s this rural charm that has some 5,400 people calling the island home (Oprah just scooped up her own $8 million estate here) and what makes it love at first sight for many couples looking for a place to say their I dos. 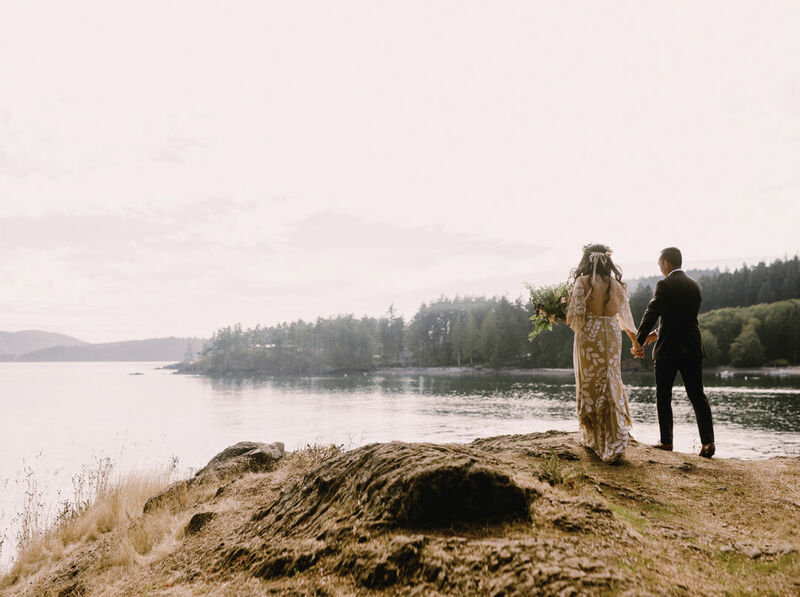 If your Pinterest wedding searches include themes like “rustic,” “boho,” and even “glamping,” then Doe Bay Resort & Retreat, on the island’s southeast side, may just be your spot. 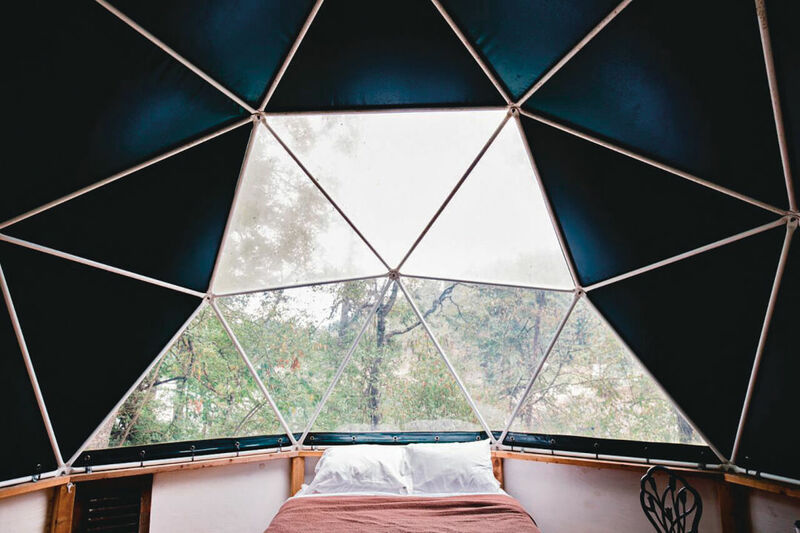 Host your ceremony on the lawn overlooking the calm waters of Puget Sound, enjoy a farm-to-table feast from the on-site Doe Bay Café, and settle in for the night among friends—the resort offers lodging in cozy cabins and houses and beachside yurts and domes. In Cascade Bay, also on the southern end of the island, the historic Rosario Resort & Spa’s expansive grounds can accommodate up to 300 guests, either outside against a backdrop of crystal blue water and neighboring islands, or inside the 1906 Moran Mansion, complete with a floor-to- ceiling pipe organ and lots of welcoming, warm wood. 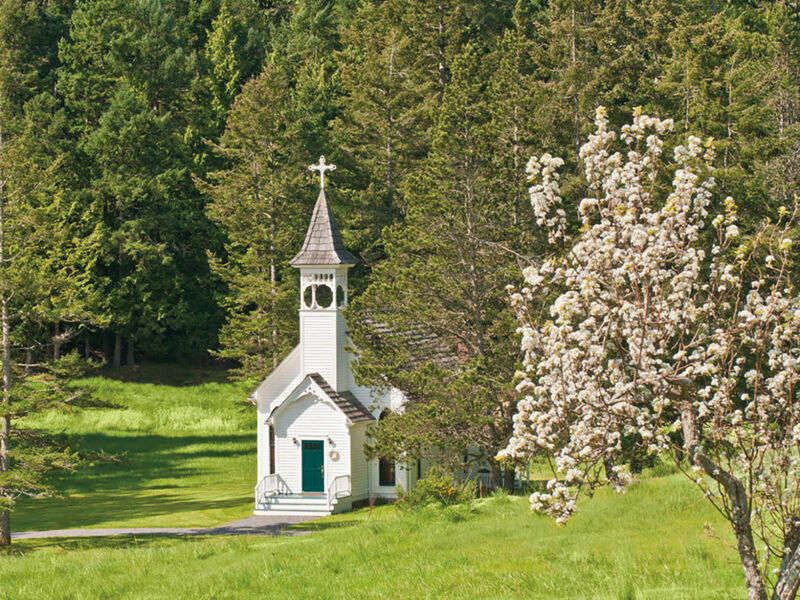 For a smaller ceremony on the island’s southwest side, reserve the Victorian Valley Chapel (they max out at 80 guests)—set among 18 serene acres of rolling hillsides, the chapel is hygge through and through with stained glass windows, salvaged pews, and Scandinavian-inspired wood beams, in a space welcome to all. 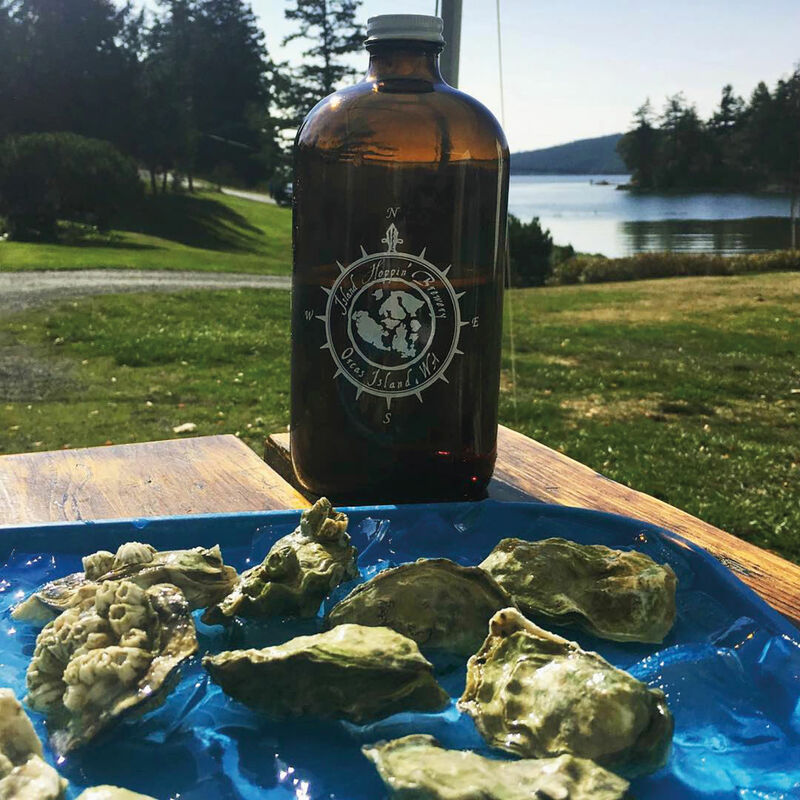 If you really want to go overboard with your Orcas Island nuptials, set sail on a private charter with Schooners North; they’ll host everything from bachelor/ette parties to rehearsals and even full weddings aboard their fully restored wooden vessel. Of course, if your heart is set on a farm affair, Orcas Island more than has you covered, thanks to its rich agricultural history. Red Rabbit Farm, with its view of West Sound, hosts smaller ceremonies in its timber-frame barn or larger groups in the meadow, and its farm-to-table suppers also make for fun post-rehearsal gatherings. Orcas Farm also offers a pastoral setting for your island I dos. You’ve booked your venue— now to fill in the details. For unique floral arrangements, Nest owner Cindy Morgan sources many of her flowers, such as lavender and dahlias, from local growers and even her own garden. Peace & Plenty also grows many of their own stems on their solar- powered farm in Eastsound, and Dogwood Flower Design clips from their own farm at the base of Turtleback Mountain. or you can pick up fresh fish, clams, and crab to-go for a DIY welcome or rehearsal dinner. Orcas favorite The Kitchen offers full-fledged catering services, including locally grown produce and island- raised meat seasoned with Vietnamese flair. Hogstone in Eastsound churns out thin- crust pizzas and seasonal small plates by owner Jay Blackinton (named Food & Wine’s Best New Chef for 2017), and it has a catering team that will bring the pies to you. Roses Bakery Café styles Instagram-ready veggie trays and fresh salads, and their crusty, fresh-baked breads are basically a table requisite for any island wedding. for kegs of their Pacific Northwest-inspired brews. When it comes to dessert, Julie Hogle bakes European- style cakes (try her lemon- lavender cake with lemon curd filling or her toasted hazelnut cake with chocolate mousse filling) out of her café, Wild Island, in Eastsound. And crèmecart wheels the sweets right to your reception or after-party, delivering ice cream sandwiches of peanut butter cookies with salted caramel ice cream, or homemade graham crackers with whiskey ice cream right from their adorable cart. Make memories last forever with the help of local photographer Satya Curcio of Satya Photography, or let the pictures come to life with videography from Orcas Video. And, if you’d rather leave all the planning details to a local expert, Kimaya Maitreya of Cloud 9 Events coordinates a number of island nuptials each year. Of course, no Orcas wedding would be complete without a little outdoor adventure, which can both work out some pre- wedding jitters (don’t worry— you’re not alone) as well as bond newly introduced family and friends. For sweeping waterfall views, head to Moran State Park on the east side of the island—the fourth-largest state park in Washington—to hike the Cascade Falls Trail. From there, continue four miles north on a scenic, winding road to the 2,409-foot summit lookout at Mount Constitution (the highest point on all of the San Juan Islands), and take in the 360-degree views that stretch to Mount Baker and the North Cascades. On the island’s west side, the nearly 1,600-acre Turtleback Mountain Preserve offers both hiking and biking trails with sweeping island views. Or get your feet wet ( just no cold feet, please!) on one of the expertly guided kayak tours by Shearwater Kayaks, where the gentle rock of the water offers a welcome moment to reflect on celebrating love and the lifelong adventure that lies ahead. From Seattle, drive the 1.5 hours north (and west) to Anacortes. From there, hop on the ferry to Orcas, where you may even spot an orca whale— several pods call the island chain home year-round. Insider tip: If you plan to drive on the ferry, book a car reservation months before, and arrive one hour prior to departure time to secure your spot. Or fly directly from Seattle via seaplane with Kenmore Air and marvel at the land and sea below.